The heady atmosphere of world snooker competition awaits in the most accomplished simulation of the sport ever produced. Take on 100 superstars of the modern game in stunningly accurate representations of the sport's top venues, including the Crucible Theatre, home of the World Snooker Championship. World champions such as Ronnie O'Sullivan and Stephen Hendry are all brought to life, ready to meet you on the green baize, along with dozens of past champions in the unlockable Champions' Trophy. Snooker tournaments throughout the 2004/2005 tour are accurately recreated, while commentary is provided by snooker legends Steve Davis, John Virgo and John Parrott. Add Pool, Billiards and Bar Billiards modes into the mix, along with vastly enhanced controls, custom player creation and upgraded online play, and this is more baize for your buck than ever before. Groundbreaking opponent AI and brand-new motion capture animations provided by Steve Davis offer a realistic look and feel to the proceedings. 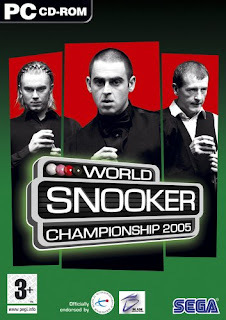 With over 100 professional Snooker players making it into World Snooker Championship 2005®, the game is brimming with snooker stars. * 100 top professionals from the current world of snooker, including superstars Ronnie O'Sullivan, Stephen Hendry, Matthew Stevens and Paul Hunter. * All real locations from the 2004/2005 tour have been accurately modelled, while tournament structures are now modelled exactly on their real-life equivalents. * Upgraded Aiming Aid for fine control of difficult shots, plus improved analogue control for better judgment of shot power. * A brand new Champions' Trophy unlockable mode. * Upgraded Online Competitions modes (PS2, Xbox, PC and potentially Wi-Fi PSP). * Custom Player Creation - put yourself into the game. * Pool, Billiards, Bar Billiards and Snooker Plus modes.